Once you've replaced your old, worn out or outdated appliances, you have to decide what to do with your old machines. Some retailers will take them for you, but you are likely to be stuck with disposing of them yourself. In addition, you may still have some other old appliances taking up space in your house, out in the garage or basement, and getting in the way. But loading, hauling and dumping large appliances can be a chore. And, in fact, it is often more than most homeowners are prepared or able to so themselves. So how to get rid of old appliances? Sometimes your old appliances have only been used or a few years or so. In those cases, assuming they are in good working condition, you simply need to find a new home for them. Or perhaps you are having to relocate and the your new home already has appliances. In that case, keep in mind that your used, but working, appliances still have value. The first option to consider is selling them. Used, but working, appliances are always very much in demand. While you could try selling them in a garage sale, don't expect to get even half the original price of your appliance. Unfortunately, this is true even if it has never been used. Appliance depreciation is fairly steep and most people are going to be looking for bargain prices at garage or yard sales. On the other hand, donating is a great option. There are numbers of non-profit groups, church or community thrift stores, and second-hand shops that would be glad to take them of your hands for a low price or for free. Donating your used appliances can be a great alternative since many of these organizations will pick them up for you and you can use the donation amount as a tax deduction. If you simply want to get rid of an old appliance with as little effort as possible, there are some businesses that will pick up used appliances and then dismantle them for the usable parts and recyclable materials. When it comes to getting rid of your unwanted appliances there are a few other things to take into consideration. In addition to dealing the actual junk hauling aspect of the job, you should consider which appliance you actually should get rid of. These are the appliances that you can't sell or even donate. Unless you find a taker who is able and willing to fix them, these appliances have no real potential for re-use. This means that your only option for disposing of them is taking them to your local landfill. However, there may be restrictions and certain disposal requirements. A great option for these unusable appliances is to call a professional junk hauling firm. A quality company will do the hard work for you and put your old appliances to good use. The good news is that you actually have other options for your reusable appliances. Used appliances such as old washing machines, dryers and refrigerators can be reused. As we noted here, your old appliances that are still usable and in good condition can be sold or donated to a charity. Sometimes, however, appliance recycling often makes more sense than selling or donating them. This is especially true if the equipment is energy inefficient or close to breaking down - or already has. Ultimately, the best option is to have your dead or dying appliances disassembled and the materials recycled. It is far better than dumping them someplace you shouldn't, or even taking them to your local dump. And if you think about it, just moving and lifting a washer or dryer takes a lot of hard work. In addition, it also requires a vehicle that can accommodate them. Better to let someone else take them for you! Not only that, some appliances require special treatment. Take air conditioning units, for example. They all contain some form of chemical refrigerant, which is usually a hazardous material. 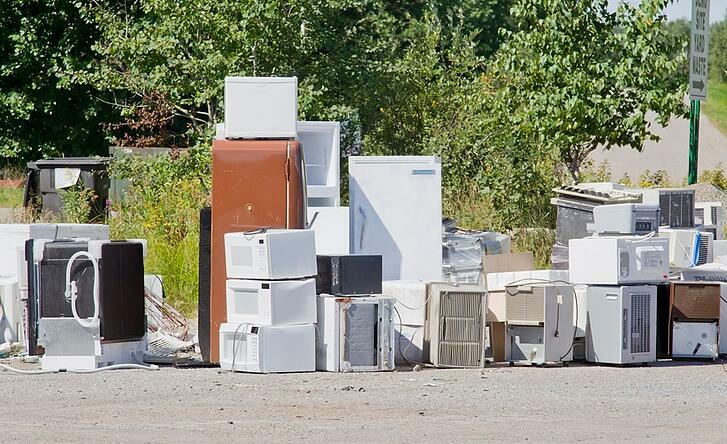 Because there are federal or state regulations mandating the proper disposal of these types of appliances, it may need to be taken to a specific disposal area, or require a qualified technician to remove the coolant, much like disposing of refrigerators and freezers. So, before you push these types of appliances into a landfill, or a dumpster, you should call your local sanitation department to find out if it needs to be prepared before it can be discarded. On the other hand, many professional junk removal teams are well trained for these tasks and they also have the right equipment to do it fast and efficiently. Recycling an appliance begins with dismantling. Once this is done, any hazardous components must be removed and properly disposed of. Afterwards, the recylcers are able to recover the reusable parts. Opting for appliance recycling helps keep substantial amounts of metal, plastic, and glass out of the landfills while reducing the need for extracting or producing these materials again. With the increasing value of various metals, recycling appliances can be a profitable venture for firms specializing in metals recovery. And since most all appliances are constructed primarily of metals - especially steel, aluminum and copper - recycling is a great approach. In addition, you can help prevent the release of PCBs (polychlorinated biphenyl), mercury, and used oil, which are hazardous waste materials toxic and damaging to the environment. Preventing these from releasing ozone-depleting substances (ODS) and greenhouse gases (GHG) helps reduce the build up of these components in the atmosphere. It’s as simple as 1, 2, 3. You make an appointment by booking online above or by calling 1.888.888.JUNK (5865). 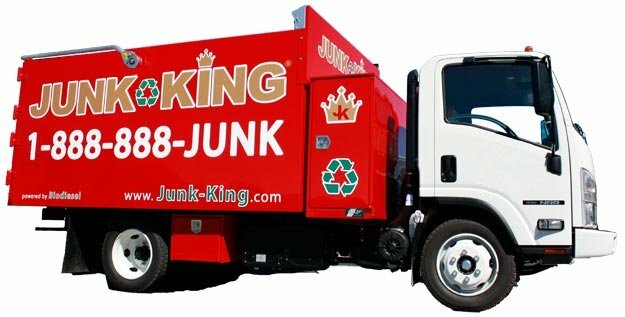 Our professional and insured junk removal team will show up at your home or office. We call 15 minutes before we arrive on site and we’ll give you a free estimate based on how much room your junk takes up in our truck, with no hidden fees.